Weapons: The God Gun, which could grant any wish desired upon firing; and the God Sword, which can cut through any known material. Sgt. John Marvel was a decorated superhero who served in the Vietnam War. After the conflict ended Marvel continued to serve his country training covert recruits for various branches of the United States Government. In the 1970’s, Sgt. 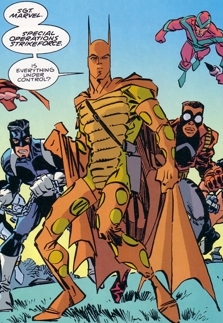 Marvel had become best friends and frequent partners with Solar Man. Solar Man decided that they should work together to violently eliminate all crime using lethal methods. Solar Man would eventually murder Sgt.Marvel’s lover, Tiger, out of fear that she was turning Marvel against him. The devastated Sgt. Marvel took drastic action against his best friend and used the God Gun to wish Solar Man out of existence before resurrecting Tiger. When the government first put together the Special Operations Strikeforce in the late 1990’s, Sgt. Marvel was brought aboard alongside Tiger as training instructors. The pair worked wonders on some of the less skilled fighters such as Barbaric and Horridus. A branch of the S.O.S. opened up in Chicago and Sgt. Marvel was made leader of this inexperienced team until Dragon agreed to takeover. Dragon and Sgt. Marvel’s personalities clashed and neither had much time for one another. After Dragon quit as leader of the Chicago division of the S.O.S., Sgt. Marvel was named as his replacement. He served in this position for over a year before the reign of CyberFace began over the world. Dragon eventually removed CyberFace from power and within a couple of years a brand new S.O.S. was formed with Sgt. Marvel as the leader. Sgt. Marvel would lead an army of superheroes on a raid of the Vicious Circle’s Gaylord Manor in order to rescue an abducted Angel Dragon. It would be his last act as leader of the S.O.S. During the skirmish, Sgt. Marvel’s own granddaughter, Dart, took advantage of the situation and shot him dead. Dart took possession of Sgt. Marvel’s God Sword and joined the Vicious Circle, turning her back on the legacy of both her grandfather and her predecessor. She had been trained over the years in the martial arts by Sgt. Marvel which had made her one of the most formidable hand-to-hand combatants in the world.